Bring the beauty of the outdoors inside with Woodland Creek’s Log Furniture Place rustic cabin furniture! Our line of indoor lodge furniture, rustic home furnishings and cabin décor lets you quickly bring the beauty of the outdoors inside to enhance the look and feel of your home, office or other retreat. Add instant charm and comfort to any space with log cabin furniture, reclaimed wood furniture and related accessories like lamps, copper sinks and 3D wood art from Woodland Creek. Have a lakeside rental? Our log beds and cottage furniture are a perfect fit! 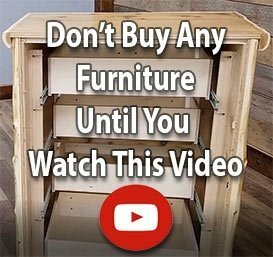 Looking for a unique twist in authentic rustic country furniture? Consider our aspen, barnwood, teak or primitive furniture lines. Nothing says country quite like century-old barnwood furniture! Are you craving a kitchen re-do? We’re here to satisfy all of your rustic décor style needs. What makes working with us even more unique? Our ability to craft Custom Log Furniture according to your specifications, our Lowest Price Promise, Free Shipping on most orders and a diverse catalog featuring 1,000’s of quality products which are proudly made in the U.S.A.
A premier manufacturer of handmade rustic furniture and long-time e-tailer of lodge décor and related accessories, the Woodland Creek’s Log Furniture Place family has served satisfied homeowners and lodge owners across the U.S. and Canada for more than 25 years.